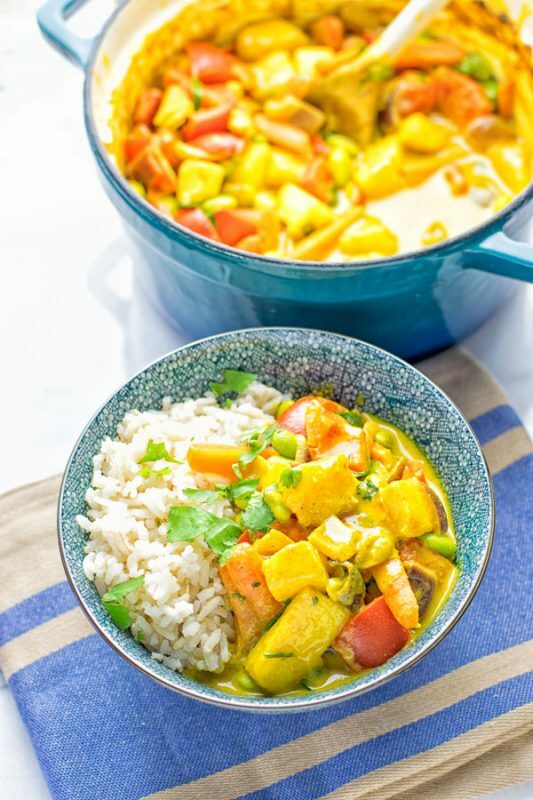 This Coconut Cream Pineapple Curry is super easy to make, versatile full of fantastic flavors and just a must make for everyone. Entirely vegan, gluten free and you can make your favorite version by adding optional extras in. I have a big fondness for curry and this time is no exception. You know I’m all about big flavors like in this Lentil Chickpea Yellow Curry or this Cashew Curry Broccoli Stir Fry. Try them and you will see these will get a big soft spot in your heart. 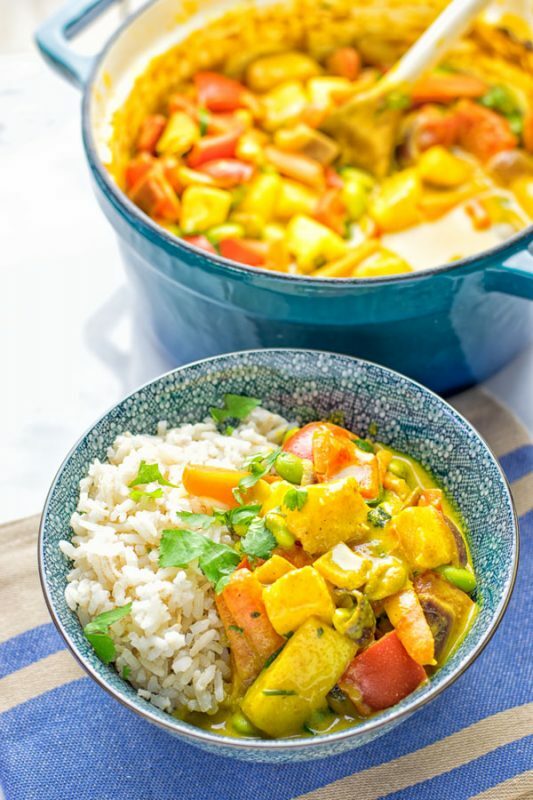 You can expect that this Coconut Cream Pineapple Curry is incredibly flavorful, creamy, easy, absolutely customizable, has just the right punch here and there. It’s amazingly satisfying, made for gatherings and company, made in one pot, addictive, mouthwatering in and out, you will thinking about my words if you ever try this. A keeper and a game changer, if you love curry. You will ask how to make a curry? It’s easy let’s do it together now. I will show you how to make the basic version and how to make a more fancier version. Simple as that: Start with a casserole dish. Use a bit coconut oil or vegetable broth for oil free cooking. Add onions and garlic, fry them for around 3 minutes until lightly golden. Then add coconut milk and spices. Cook for around 5 minutes. After 5 minutes, add pineapple chunks to that casserole and cook for 7 minutes longer. 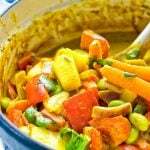 If you want to make the curry with the optional add ons, like carrots, bell pepper, lime juice, or edamame, add them with the coconut milk. The cooking step then will take a bit longer, more like 15 minutes. Divide into plates, serve alone or with some bread or quinoa as well. It’s pretty easy to make. You only need the curry spice mix which I made for this curry recipe. You can use of course a pre-packed curry mix, but I find my own one has just the right amount of flavor and spice. Plus it’s all natural, preservative free, and done in no time. It makes an amazing dinner, lunch. It’s also great for festive gatherings, potlucks, or movie nights. Believe me, there isn’t anything more comforting watching a great movie with a warming bowl of this curry in your hands. It’s absolutely delicious plain, but you can serve it with rice, quinoa, bread, potatoes, and I guess pasta would be delicious as well. 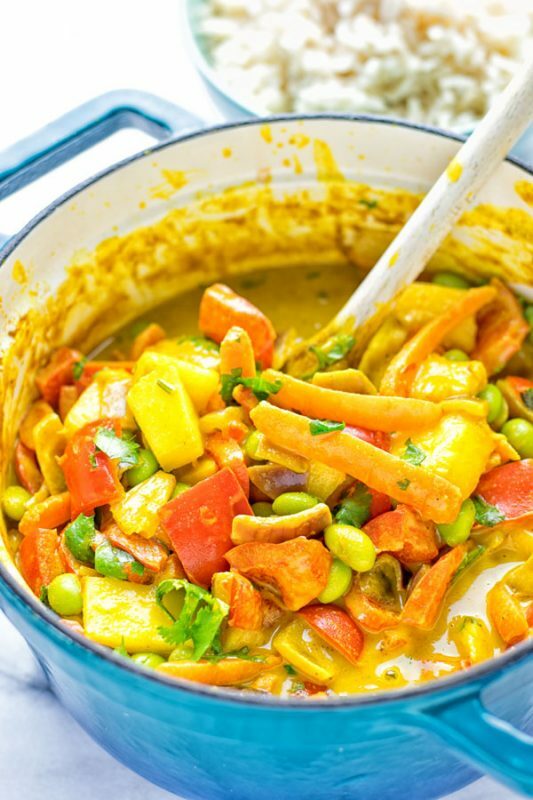 This is an absolutely to go curry recipe for you. You can try the basic version first and next you can choose 2 more things from the optional add ons. Then you try more or go for all. There is so much fun in the kitchen, while it’s simmering it will smell incredible. So your kitchen will smell every time absolutely amazing. 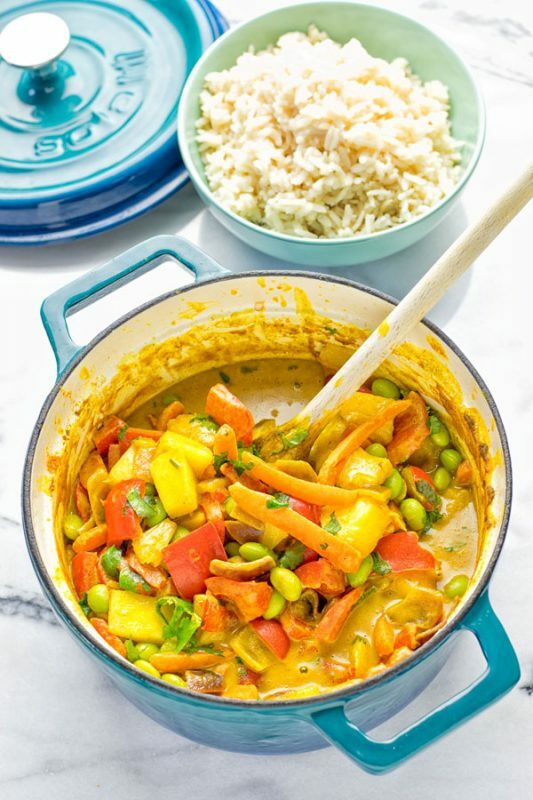 If you wanna try this Coconut Cream Pineapple Curry, you know it’s not only satisfying and delicious. It’s made with pineapple, which is high in vitamins. Think about C, B6, beta-carotin, thiamin, folate, minerals like potassium, cooper, manganese, calcium, or magnesium. Also it’s a immune booster. By stimulating the the activity from white blood cells, which reduces illness and boosts the system at the same time. Good for bones: thanks to it’s high amount of manganese which strengthens, grows, and repairs bones, and reduces inflammation of joint and muscles. 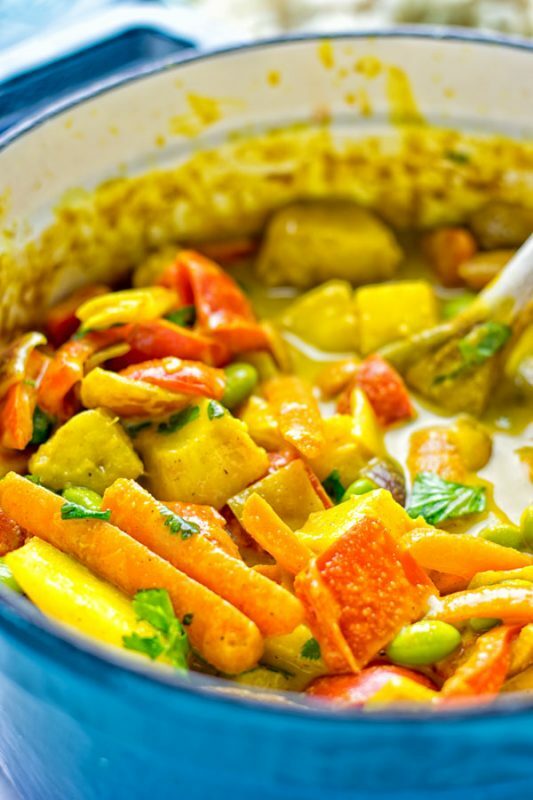 If you try this Coconut Cream Pineapple Curry, tag me on Instagram and Facebook as always. Show me your remakes with a picture. 2 tbs curry powder, 2 tsp ginger, 1 tsp chili powder and 1/2 tsp turmeric. Start with a casserole dish. Use a bit coconut oil or vegetable broth for oil free cooking. Add onions and garlic, fry them for around 3 minutes until lightly golden. Add pineapple chunks to that casserole and cook for 7 minutes longer. If you use the optional add ons, like lime juice, bell pepper, peas, add them in step 2 but cook for 15 minutes instead of 5. I just made this curry for lunch. It ws totally delicious.Thank you for the recipe. I used however two cups of pineapple instead of one and added a few more Indian spices like mustard seeds, star anis, cardamon, cinamon stick, curry leaves from my garden etc.to the recipe. 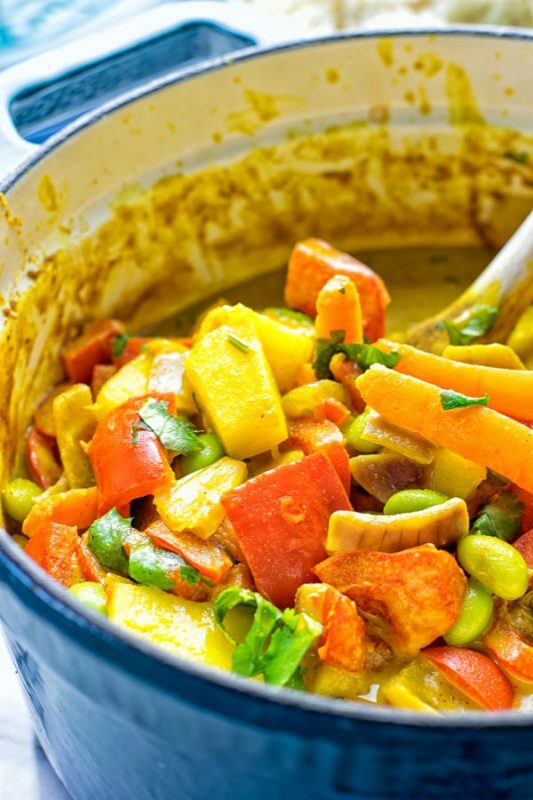 Depending on how aromatic your curry powder is, it may become just as good without added spices too. I served this curry with quinoa instead of rice today. Thanks for your amazing feedback and making it! Glad it was such a big hit! I hope you’ll find lots of more recipes to try! My husband and I made this yesterday and absolutely loved it! We’re currently somewhere with limited amount of ingredients and this made it easier for us to eat something different and delicious. Thanks for the recipe! Thanks for your amazing feedback and making it, Geraldine! I hope you’ll find lots of more recipes to try! Thanks for your amazing feedback, Mindy! I hope you’ll find lots of more recipes to try!